The Suspicionist: Standing Rock Sioux VS Trump----The New Administration's First Domestic Crisis? 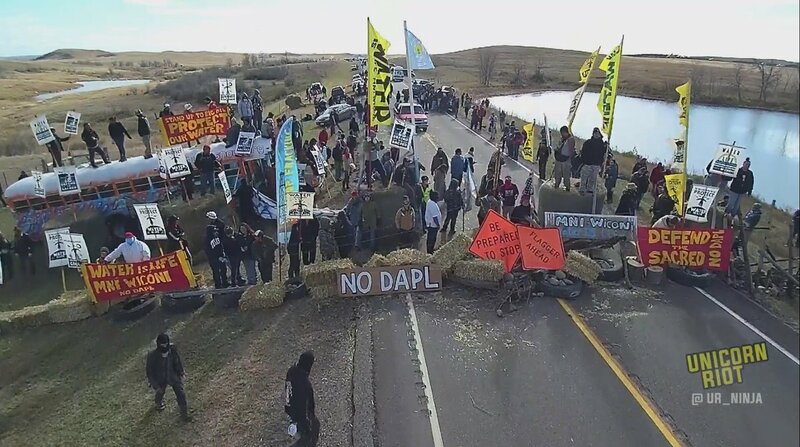 Standing Rock Sioux VS Trump----The New Administration's First Domestic Crisis? Is A Shocking Clash Coming? The Sioux anti-pipeline protests earlier in the Fall were met with violent suppression by security officers and other mercenaries of the Dakota-Access pipeline company. 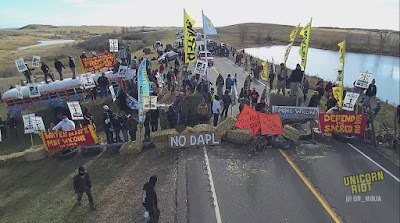 And still, the Dakota Sioux and their allies, who stand in opposition to the oil pipeline project across Sioux land, and feel it threatens their long-term water supply, are determined to stand strong. as a result of a reported 2000 or more vets who joined the Movement. connection between the vets and the Sioux. Obama delayed construction back in September-October, but only temporarily. Obama finally kicked the ball into the near future of Trump's administration with his ordering of an Environmental Review. Perhaps he could have acted more boldly, perhaps not. It is hard to say what his other alternatives would have been. could possibly be a confrontation with tragic results. Trump has strong ties to the Dakota Access pipeline company that go beyond his stock ownership, and involve big campaign donors. Although Trump has now reportedly sold his stock in the Pipeline Company, his Energy Secretary pick, Rick Perry, also has strong connections to that same company. And Trump has recently said he wants to see the pipeline built. 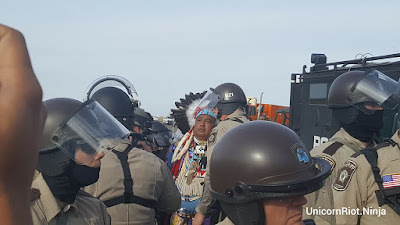 President Trump may be tempted to show his "strength" in this confrontation, supporting the company as the Chief Executive, and green-lighting extreme tactics, forcing the Sioux, by any means necessary, to acquiesce. If this is done using intense, state-sanctioned violence (the company would likely employ its most hard-core private security forces), and protestors or bystanders (Sioux, Veterans, or Press) actually DIE, it could split the country, and put Trump's presidency into crisis right-off-the-bat. How hard will Trump's response be? Can he find a middle-ground? Does he even want to? Or, will Trump surprise everyone and act as an honest peacemaker between the 2 sides? 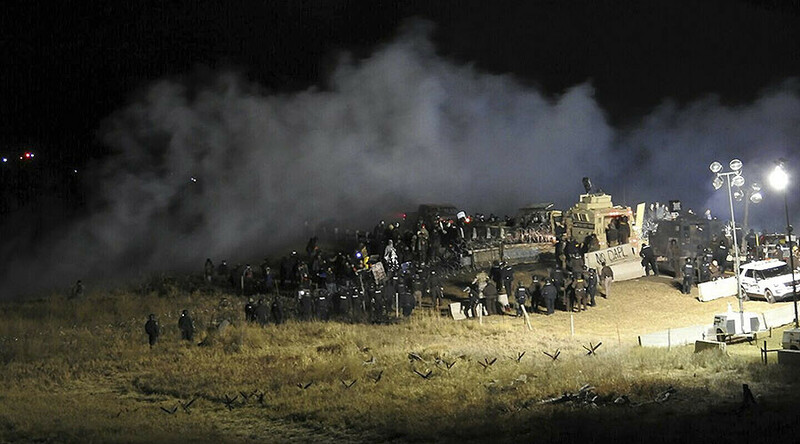 protests, especially by white citizens unsympathetic, or even possibly racist, towards the Sioux. Is this situation building-up into a powder-keg? and his much-discussed temperament, possibly right after his inauguration. The country, and the world, will be watching. And the stakes will be high. I urge everyone to join in the fight across the Nation. To all band together and fight trump and his hateful racists agenda. He's already showing signs of a Dictator. And I will not stand silently aside while he and the republicans dismantle everything that our Greatest Leader of the 20th Century gave us. Water is life and we must protect it or we're all done for. I can easily see this as being a flashpoint for our country. Trump's agenda will be revealed and it is time for liberal's to embrace 2nd Amendment rights to protect themselves and country. I hate even thinking that, but it is true.